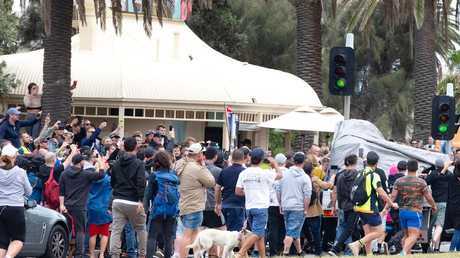 Hundreds of people have faced off in St Kilda, with far-right rallygoers scuffling with civilians. 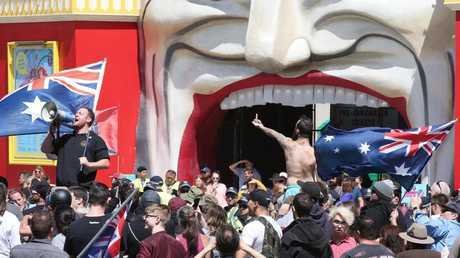 Twice-dumped Senator Fraser Anning is under fire for joining far-Right wing extremists at a wild protest in St Kilda on Saturday. 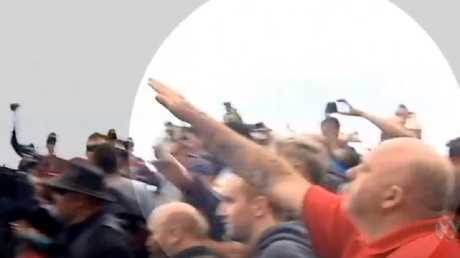 It comes as shocking footage of far-Right protesters gesturing with Nazi salutes was captured on video after hundreds of rallygoers and counter-protesters faced off for more than four hours. 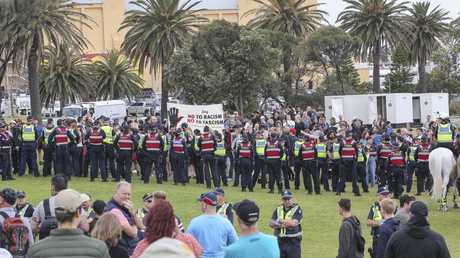 The foreshore was put into lockdown as police formed a human wall to separate warring far-Right and anti-racism protesters. 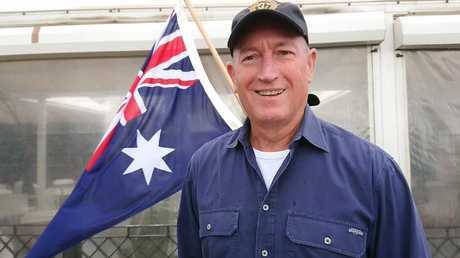 Senator Anning, who received just 19 first preference votes to secure the $200,000-a-year spot in federal parliament, flew in from Queensland to attend the rally. 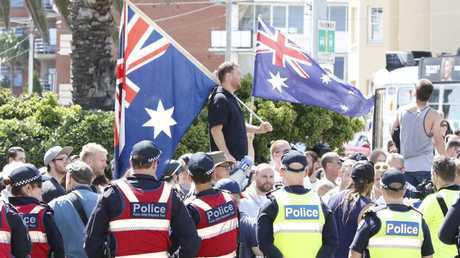 He praised the event on Facebook and posted a video of himself with United Patriots Front leader Blair Cottrell. The controversial crossbencher claimed "Australia has had enough". "I think this is the start of something bigger. The revolution will eventually start," he said. 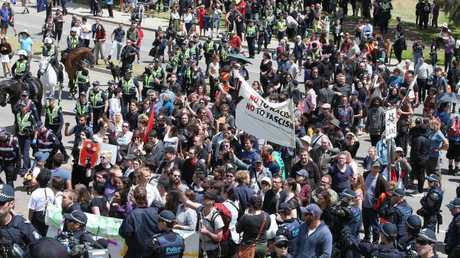 "This rally is Australian people showing their disgust with the Australian government for allowing garbage like these Sudanese thugs coming into our country and … attacking us in our own country. 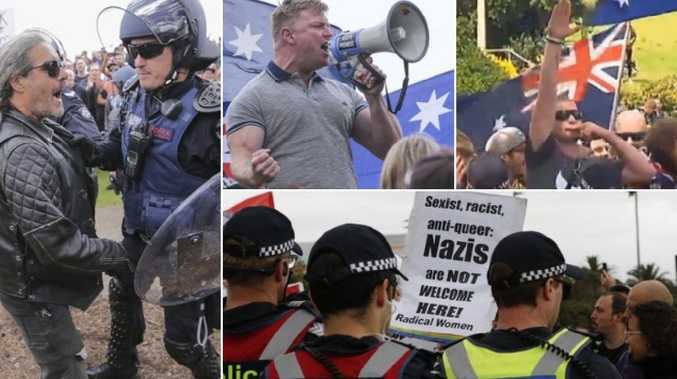 "There's a lot of good Australians who are completely sick and tired of our governments bringing in people that bludge off us and attack us in the streets." But outraged colleagues have blasted Senator Anning - who used the Nazi phrase "final solution" in parliament - saying his actions make him unfit for parliament. "The government should refuse to take Fraser Anning's vote. 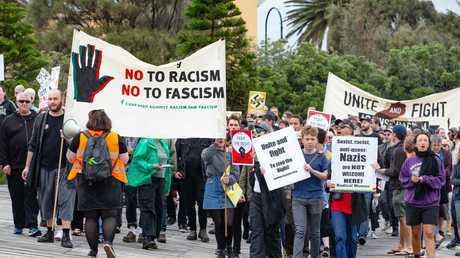 Hanging out and supporting with neo-Nazis who are inciting violence is inexcusable," Greens Senator Sarah Hanson-Young tweeted. Labor MP Tim Watts said racist behaviour can't be tolerated. 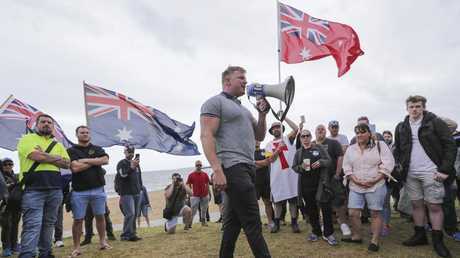 "Around 100 neo-Nazis, white nationalists and racial supremacists rallied in St Kilda accompanied by an Australian Senator," he wrote. Fellow crossbencher Derryn Hinch said Senator Anning's behaviour was "repugnant". Race Discrimination Commissioner Chin Tan slammed the rally, releasing a statement condemning it "in strongest possible terms". 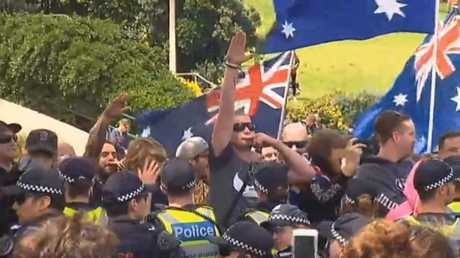 "There is no place for such rallies in Australia," he said. 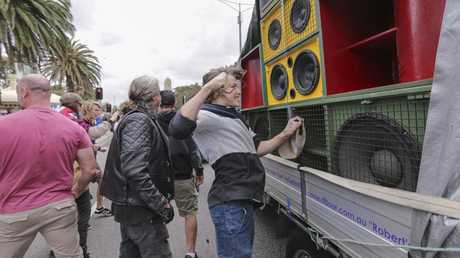 "All Australians have a right to protest peacefully, it is one of the great freedoms we enjoy. "It is, however, never acceptable for people to act or conduct themselves in ways that are likely to, or intended to, inflame and incite racial fear and tensions, hatred and violence." 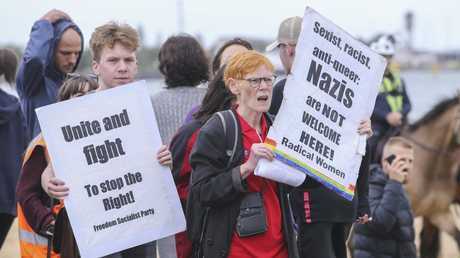 At least three men were arrested and pepper spray deployed as protesters clashed when about 100 right-wing activists turned up to the event. A further 100 from the Campaign Against Racism and Fascism turned up to voice their views. Both groups combined were outnumbered by police. 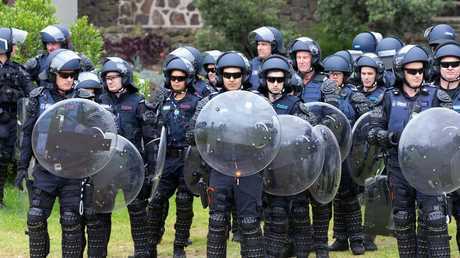 Capsicum spray was unleashed to quell disobedient protesters and at least three people were arrested. 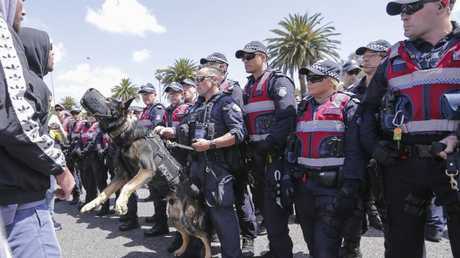 Members of the riot squad, the public order response team, the dog squad and uniformed police saturated Catani gardens in St Kilda. Police conducted bag and weapons checks in the area. 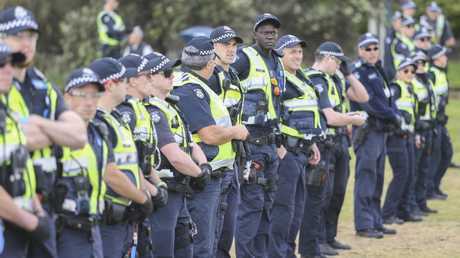 Supt Silva said he was generally pleased with the behaviour of the crowd of hundreds gathered on St Kilda foreshore this afternoon. 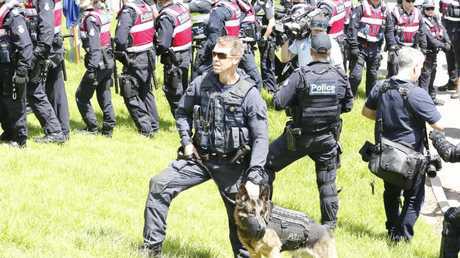 He would not disclose how many officers were patrolling the area, but said there were "ample police" to control the situation, including members from the riot squad, canine unit, mounted branch and air and water police. 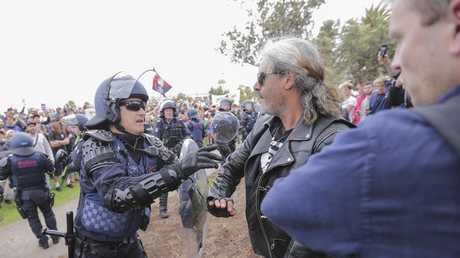 Supt Silva said both the far-right and far-left protesters gathered had been as "noisy and meaningful" as each other. "It was a fairly large gathering with about 300 people on both sides," he said. "I hope the public feel reassured we had this under control, I certainly felt we had it under control." Cottrell and co-organiser Neil Erikson in 2017 were convicted and fined for inciting contempt and ridicule of Muslims by making a video in which they beheaded a dummy with a toy sword in a protest against the building of the Bendigo mosque. Cottrell is appealing. The pair claimed the rally was a response to recent incidents in which youths have mugged people along the bay. Erikson last week confronted a group of young men of African background who were playing soccer at St Kilda, prompting police intervention.